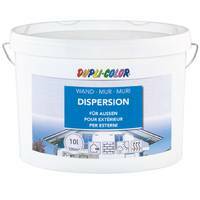 DUPLI-COLOR Exteriour Dispersion has low odour and is pleasant to work with. The painting stands out by good coverage, enormous efficiency and adherence. It is weather- and abrasion resistant. Possible substrates: masonry, concrete, chalk und synthetic plasters, cement, wallpapers, dispersion coatings. Object and working temperature at least 5°C. Remove chalk and mineral paintings mechanically. Strong absorbant and sanding substrates should be primed with a substrate stabilizer. Can be diluted with max 10 % water. This paint can be re-coated after 4 hours.